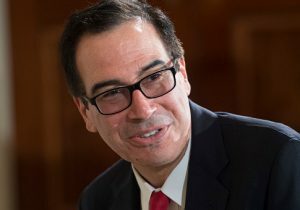 Treasury Secretary Steven Mnuchin touted the Trump administration's goal of tax reform as being so simple and fair that it can fit on a postcard, at an event in Washington, D.C., on Monday. Speaking at the Newseum at an event hosted by Americans For Prosperity and Freedom Partners, the secretary said tax reform will help the average middle-class person by bringing back good-paying jobs. "We will pass tax reform, and this is about creating jobs, this is about creating wage growth, this is about a simpler and fairer tax system," Mnuchin said. "We're going to simplify personal taxes where 90 percent of Americans will be able to fill out their tax return on a large postcard." "You can imagine how that makes things easier for them and easier for us at the IRS," he said. "And we're going to make business tax competitive again and bring back trillions of dollars of money that's offshore that's going to invest in America in jobs, in factories, and capital." Marc Short, the White House director of legislative affairs, said that they are on the same page with the House and Senate before the bill goes to committees for markup. "Hopefully over the month of August, a lot of texts will be drafted and written as we head past the Labor Day recess. We'll start with markups right away, and it's important to show that we're all on the same page," Short said. Short said tax reform is something that has to be done this year, since over the last eight years Americans have endured an economy that was not growing. "As the secretary said, Americans have been struggling under an economy that has not been growing for far too long," Short said. "The stagnation of the economy is something that has cost many Americans jobs." "We want to make sure that middle-class families are getting the tax relief that they need," he said. "But we want to make sure that the corporate rate is fair so that American jobs can stay here instead of fleeing overseas." Mnuchin said the current rate of 35 percent is one of the highest in the world and the goal of tax reform is to broaden the base so the rate can be brought down. "We're going to broaden the base so as we bring down the rate to a competitive level, we're going to get rid of lots of deductions, and we're going to make sure that companies reach economic decisions that are good for Americans and that are good and competitive and fair," Mnuchin said. "We want people to be able to compete against countries and businesses all over the world." He also noted that tax reform will not only focus on the corporate rate, but the business rate, which affects small- and medium-sized businesses like pass-throughs or subchapter S companies as well. In addition, Short noted that the border-adjustment tax, which levies a 20 percent tax on imports, would be removed from the table. "We're now united in where we're going, not just in lowering taxes but making sure revenue gains come from the growth as well as eliminating deductions," Short said. Mnuchin said that tax reform is just one of three components of President Trump's plan for economic growth. "President Trump is all about economic growth, and we are determined to have 3 percent or higher GDP, and that’s going to be done with three parts. The first is tax reform, the second is regulatory relief, and the third is trade," Mnuchin said. "Those three are going to be what brings back jobs and good paying jobs here, and tax reform is critical to that, and it's critical to that because we need to have a fairer and simpler system where our current companies can compete."